In today’s digital world, it’s more than likely that you have encountered some form of video or light projection. If you’ve seen musical performances similar to that of Stromae’s Racine Carrée Official Live Concert, or Cameroonian singer-songwriter Irma’s music video for Save Me, then you’ve experienced the power of video mapping. Artistic direction is key to creating a memorable production, and video and light projection – or video mapping – can dramatically enhance an artist’s performance. Remember when your middle school teacher projected notes against a screen during class? It’s like that, but much more multi-dimensional; it’s literally the next level of projections. So what exactly is video mapping? Also called fresco light, video mapping is a digital, optical art form that 2D projection to the next level by creating 3D shapes that fill complex shapes and spaces. Video mapping is the merging of virtual software, real world objects and video to create intricate and spectacular shows. Through virtual software, an artist scans an object or space to create a three-dimensional digital imitation of exact proportions. With this data, the software is able to project a video on the standing object or space and follow its shape and movements, if any are made. Nicknamed the “illusionist projection”, this new discipline emerged at the end of the 90’s and has gained popularity as a performance art form. By combining spatial proportions with software, a new wave of artists and creators are discovering a unique way of taking over public space and creating sophisticated theatrical performances. Even cities are getting in on the mapping phenomenon, using their unique structures as a canvas for cultural storytelling. A perfectly Canadian example of this is the Northern Lights show on Parliament Hill, which first took place in 1984, and has told the story of Canada through this visual art for over 30 years. 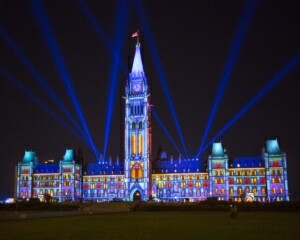 The most recent show, Mosaika: Canada through the eyes of its people, uses cutting-edge technology to project Centre Block and the Peace Tower with high-definition video. 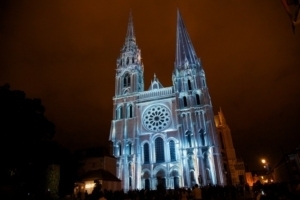 Across the pond, the Tourism Office of Chartres in France organized the first edition of Chartres en Lumiere in 2003, displaying twenty-six original lighting and video scenographies across the cathedral’s exquisite architecture. Arthur Gaillard, Creative Director of Montreal’s creative agency MASSIVart, and creative arts festival Chromatic, has worked with many artists who use video mapping in various ways. Glossi asked Gaillard to share his ‘Top 5’ incredible video mapping creations. So where does Toronto stand in the video mapping discipline? 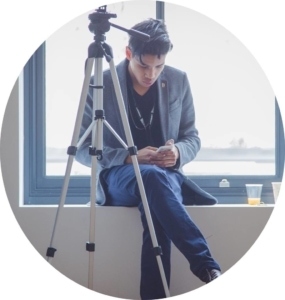 The city has many creative artists and agencies you can follow to see real fresco light with your own eyes. Forms Festival has featured many artists as Nick Verstand and Nonotak & Shiro. Jackie Levitt: GTA-based artist who has used different effects, including sounds, to amplify her creations. Finally if you’d like to participate in, or learn more about video mapping, Le Labo is the place where you can find artist exhibitions, installations, workshops, conferences and artist talks.